Let's talk about 30-40% of your electricity bill. That's how much it costs the average homeowner or commercial building owner to provide proper heating, ventilating, and air-conditioning (HVAC). A good HVAC system is the key to maintaining a comfortable, healthy and interior environment. Through the years, I have been asked by many owners for a strategy to reduce their cost of energy and HVAC. They don't want to sacrifice the interior environmental conditions, but they do want a point-by-point plan to follow. The interesting thing that often happens is that energy bills are lowered substantially and the HVAC system performance is improved. This is a standard function of any mechanical engineer specializing in energy and HVAC. The second step to achieve energy and HVAC system optimization is knowing your system. Your HVAC system is critical to your interior environment, but it also represents a large component of your utility expenses. While it is beyond the scope of this article to discuss every system, a few recommendations can be addressed. Every HVAC system component has increased in efficiency over the years. If your system is more than 13 years old, it's time to begin planning for an upgrade to new equipment. Well maintained residential systems have a life expectancy of about 15 years or so but seem to fail at the worse times. Have a replacement plan ready for the day your equipment fails. Verify your HVAC system load. Home owners should use ACCA's Manual J calculation method and all others should have a load conducted by a mechanical engineer. Commercial buildings have more requirements related to code conformance, minimum ventilation rates, etc and are individual to each building. Replace your air filters regularly. Don't use anything less then a MERV 5 filter to assure dust and fibers are removed. Clean filters will save fan energy. Visit Sandium.Com for more information. 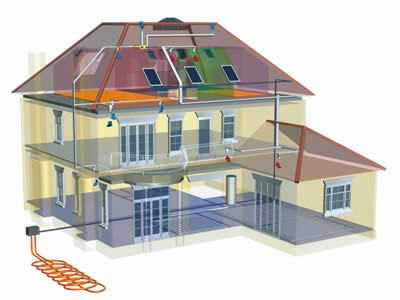 Visit my site for more information on Energy and HVAC optimization. I am a professional engineer with over 30 years of design experience relating to plumbing and mechanical systems. The articles I write are the result of many successful commercial and residential installations. Well post sharing in this blog, it quiet very useful to me. This is what I'm looking for about HVAC, anyway, do you have videos about HVAC guides? Your is one of the best and complete info about HVAC tips. Thanks for sharing to us. I wonder if you have more updated articles in this blog. Thanks. I've been thinking of having my hvac looked at. Since winter is coming, we need to get our heating going. Hopefully we can get this done this week. It gets chilly during the nights.